Narendra Modi, the winning prime ministerial candidate of India’s main opposition Bharatiya Janata Party (BJP) for the 2014 general elections, is seen as India’s most divisive politician – loved and loathed in equal measure. Mr Modi, who has been chief minister of the western state of Gujarat since 2001, is seen as a dynamic and efficient leader who has made his state an economic powerhouse. But he also is accused of doing little to stop the 2002 religious riots when more than 1,000 people, mostly Muslims, were killed – allegations he has consistently denied. When he was named as the head of the BJP’s campaign last June, the Janata Dal United (JD-U), a key ally of the BJP-led National Democratic Alliance, pulled out fearing that it would lose the support of Muslims in the state of Bihar, where it ran a coalition government. Mr Modi became an international pariah after the riots – the US denied him visas and the UK cut off all ties with him. But a decade later, the controversial politician has been reintegrated into the political mainstream. Last year, US Ambassador to India Nancy Powell met Mr Modi to discuss the US-India relationship, regional security issues, human rights, and American trade and investment in India. And in October 2012, the UK’s high commissioner in India met Mr Modi and invited him to address MPs in the House of Commons. 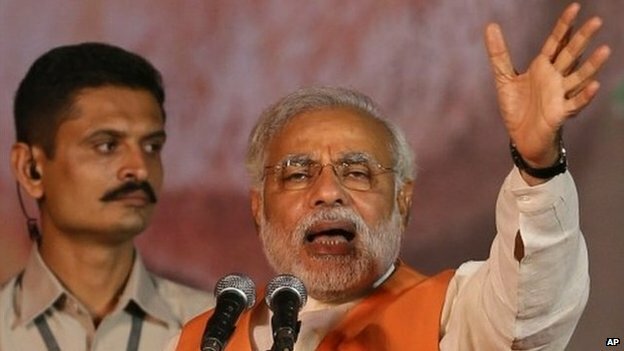 Tory and Labour MPs defended their decision to invite Mr Modi to speak, saying his voice needed to be heard. Mr Modi led the BJP’s campaign for the April-May general election from the front – he says headdressed 440 rallies across India. 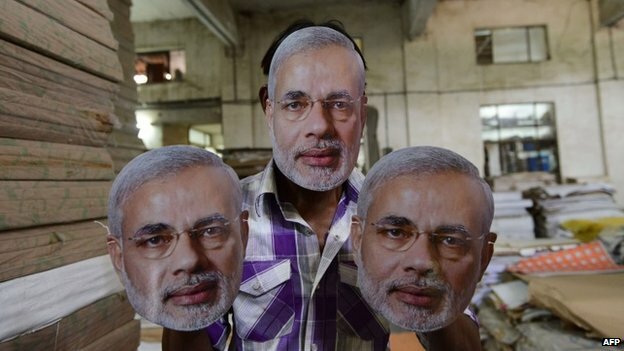 At his packed election meetings, supporters wore his face masks and tea was offered at more than 1,000 stalls across India in paper cups with Mr Mod’s pictures on them. He also used social media effectively, even resorting to 3D holograms to communicate directly to voters. A brilliant speaker, the Hindu hardline party’s poster boy is often called the BJP’s brightest star, and his supporters began a spirited “Modi-for-PM” campaign long before the party overcame some stiff internal differences to anoint him as its candidate. Many Indians, however, say they cannot accept Mr Modi as prime minister because of his alleged role in the Gujarat riots. His critics have accused him of “rewarding her with the ministership” for her role in the riots. Mr Modi may polarise public opinion in India and abroad, but he has also been credited for bringing prosperity and development to Gujarat and enjoys support from some of India’s top industrialists. The state’s economy has been growing steadily, and Mr Modi’s image is that of a clean and efficient administrator who is corruption-free. As a result, he has been re-elected three times as chief minister. When he was first re-elected in December 2002, a few months after the riots, his biggest gains were in the areas of inter-communal violence; he campaigned openly on a platform of hardline Hinduism. But in the state elections held in 2007 and 2012, he talked mostly about growth. While those who benefited during his time as chief minister applauded his return to power, for the victims of the 2002 riots, his victory was just one more symbol of injustice. He has never expressed any remorse or offered any apologies for the riots, and many Muslims displaced by the violence continue to live in ghettos near Ahmedabad, Gujarat’s largest city and commercial capital. Mr Modi’s personal life has also been under scrutiny, with critics accusing him of deserting his wife Jashodaben. In the run-up to the election, for the first time he publicly admitted that he was married. The RSS, founded in the 1920s with a clear objective to make India a Hindu nation, functions as an ideological fountainhead to a host of hardline Hindu groups – including Mr Modi’s BJP with which it has close ties. 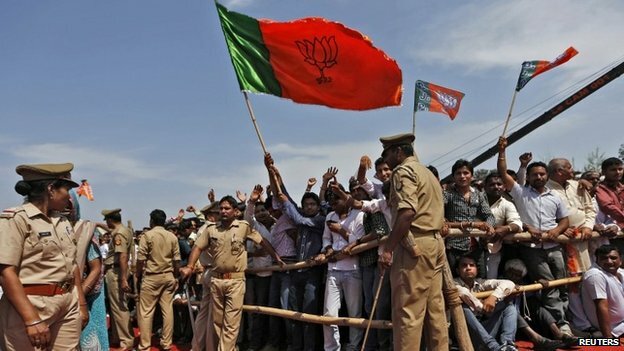 The RSS has a particularly strong base in Gujarat, and Mr Modi’s ties to it were seen as a strength the organisation could tap into when he joined the state unit of the BJP in the 1980s. Mr Modi has a formidable reputation as a party organiser, along with an ability for secrecy, which comes from years of training as an RSS “pracharak” or propagandist, analysts say. And Mr Modi’s colourful website beckons users in with more than a nod to his muscular nationalist campaign: “India First!” it proclaims to visitors. Wellthisiswhatithink says: It remains to be seen whether Mr Modi can overcome his controversial past and unite this very complex nation. A period of uncertainty inevitably follows, which is never helpful in the sub-continent. His win will be popular with business, but it remains to be seen whether he can pull together the disparate strands of Hindu nationalism with the country’s many minority groups or broadly inspire the working class. I have spent quite a bit of time in India over the past three years and view this result as possibly the most important election result in India’s modern history. in my humble opinion, Modi will drive necessary reforms into the business community ( including regulators etc) that will allow India’s GDP to grow at 7-9 percent and get foreign investment into the country for many difference initiatives including its massive infrastructure pipeline. The fact is that if India’s one $ Trillion plan for infrastructure can be funded in part by foreign investment then roads and transport can be improved significAntly and this will help all Indians. India’s population is likely to surpass China in the next decade and by 2030 it’s GDP will out strip Japan’s…..this is not just an emerging market, it is THE emerging giant. An interesting perspective Simon, thank you, and thank you for taking time to give your knowledgable perspective.